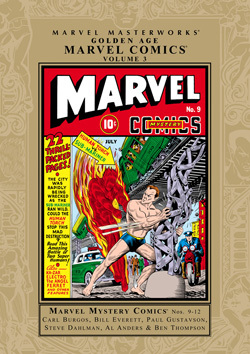 TORCH VS. NAMOR: A CLASSIC BATTLE HITS MASTERWORKS! The wait is over and the stage is set. 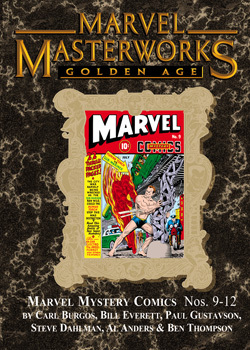 It’s fire vs. water in the most famous battle of comics’ Golden Age! 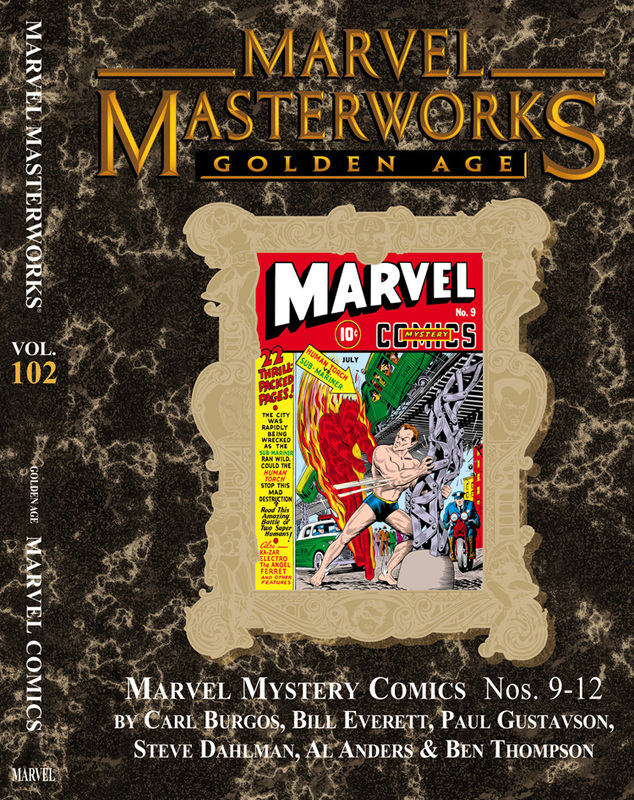 Breaking new ground like none other, Marvel Mystery Comics, the flagship title of Marvel’s earliest days, started a craze that defines super-hero comic books to this day. With hero pitted against hero in a fight to the finish, you’d better place those bets and settle into your seats. ’Cause it’s the final round of the Human Torch vs. the Sub-Mariner! 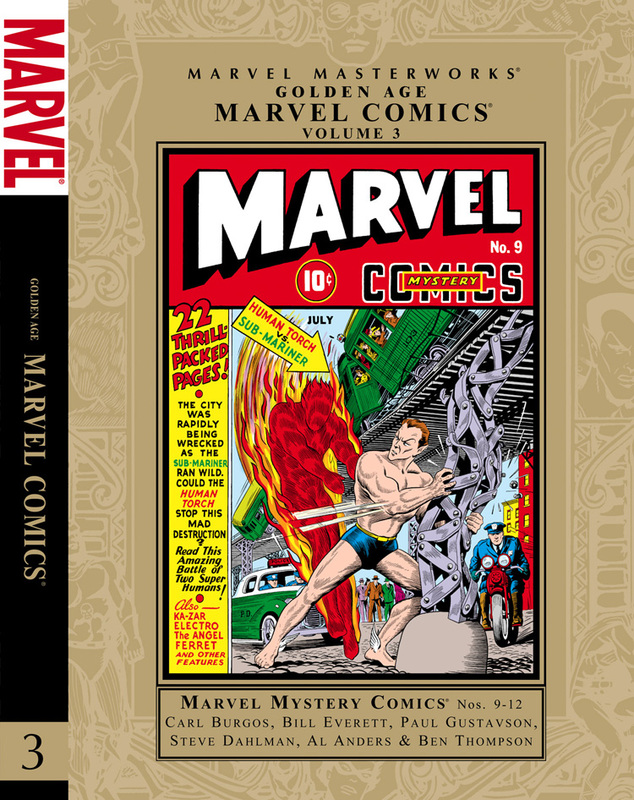 Headlined by the lavish, manic, and truly amazing Sub-Mariner by Bill Everett and the high-flying Human Torch by Carl Burgos, Marvel Mystery Comics is a bonafide treasure trove of Golden Age action and adventure. The awesome and idiosyncratic Steve Dahlman brings you Electro, the Marvel of the Age, the monster-stomping robot featured today in The Twelve, while Paul Gustavson’s Angel woos damsels in distress and battles the undead evils of the subterranean realm, and the jungle adventurer, Ka-Zar the Great, protects the Belgian Congo from the threats of the outside world. Also featuring the wild western tales of the Masked Raider, boy-adventurer Terry Vance, and a host of four-color companions, each has been painstakingly restored to provide you with the best experience of these truly classic tales.